Get ready to vanquish dragons, cast spells, and come face-to-face with sea monsters in Fairytale Land! 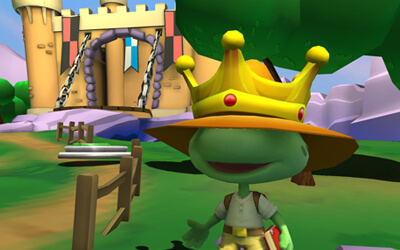 In the second land available in JumpStart Academy Kindergarten, players will get to wander through a world found within the pages of their favorite stories! With so much to explore and loyal friends by their side, your child will love going on a learning journey! When players first come to Fairytale Land, they will discover a world filled with magic, adventure, and bravery! Players can dive into their favorite stories and be guided through them by their favorite JumpStart Academy characters. For example, Kisha will tell your child about fairies, Hops will discuss knights and dragons, and Eleanor will talk about the appeal of books. As your child treks through this strange and enchanted world, they will be learning essential Common Core standards that will give them an academic advantage over their peers. Their journey through Fairytale Land is guaranteed to help your little learner develop a love of reading. So what is your young scholar waiting for? Adventure awaits in Fairytale Land!